Calling India unlimted Cheap today and don't get fooled with Calls to India get the better than cheapest calling card to India with Pidipompi Unlimited India Calling, call india unlimited, unlimited calling to india. Already a Pidipompi customer and want to sign up for Call India Plan? 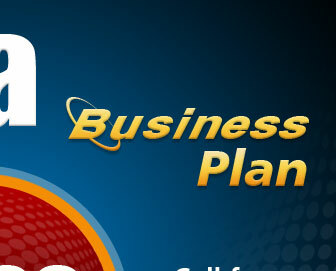 Simply log in to your Account and click on “Call India Plan” available on home page to order Call India Plan today. 1. Local access to all locations is NOT available i.e. local number access to all customers can not be ensured. If the customer is not covered by local access numbers he/she is advised to use phones/cell phones those have nation wide free dialing to access Call India Plan. 2. Toll Free Access is not available at this time, only local numbers in area where we have network is available. 3. 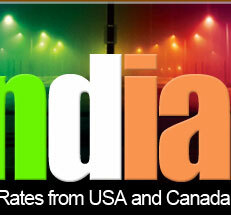 Call India Plan service is currently available for outgoing overseas calls from within the USA and Canada. 4. If you want an add on service on a different number you can get it for $14.99/month + service fee. If you register the add on service at any later point in the monthly billing cycle then you will be charged for remaining days of the current billing cycle and then from the next billing cycle the complete amount will be charged Call India Plan fee + 14.99 + service fee. To add different number call customer service. 5. 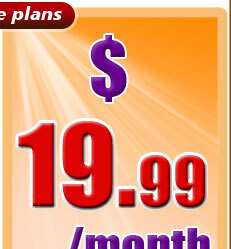 Charges Flat $9.99 or $14.99 or $19.99/month + service fee only. 6. If you used your minutes within 30 days from the date of purchase and recharged the plan, then charges will be $19.99/month. After 30 days, charges will be flat previous recharge amount. Customer will be responsible for all usage of and all charges incurred for service. 7. Call India Plan is not a Substitute for Your Local Telephone Service. Call India Plan is NOT a substitute for customers local telephone service and so call India Plan does NOT support 911 emergency calling facility. 8. Call India Plan is a pre-paid long distance service ONLY and is available as long as there is payment in full made for the service period in advance and the user agrees to the terms and conditions of the service. Your credit card on file will be charged automatically on the same day you signed up for the plan. 9. We do not provide call details online or as a bill for user viewing purpose since this is not a per minute service we only can give upon written request, total minutes used in a given timeframe and total numbers of unique calls made. 10. The account number is the customers first registered telephone number and it can not be changed by the customer. In Six month customer is allowed to change number 1 time only. If customer wants to change number more than 1 time in six month there will be service fee of $5 per change each time. 11. Pidipompi.com reserves the right to charge fees, surcharges and/or price at any time upon without prior written notice to you. 3. 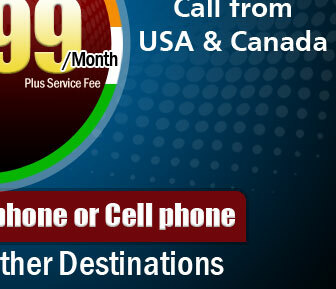 Call India Plan service is currently available for outgoing overseas calls from within the USA and Canada. All accounts have Call India usage based on business calling of any caller. Business calling is defined as person who call 72,000 minutes in annual basis or 6,000 minutes on monthly basis. 5. Charges Flat $49.9/month + service fee only. 6. Call India Plan is not a Substitute for Your Local Telephone Service. Call India Plan is NOT a substitute for customers local telephone service and so Call India Plan does NOT support 911 emergency calling facility. 7. Call India Plan is a pre-paid long distance service ONLY and is available as long as there is payment in full made for the service period in advance and the user agrees to the terms and conditions of the service. Your credit card on file will be charged automatically on the same day you signed up for the plan. 8. We do not provide call details online or as a bill for user viewing purpose since this is not a per minute service we only can give upon written request, total minutes used in a given timeframe and total numbers of unique calls made. 9. The account number is the customers first registered telephone number and it can not be changed by the customer. In Six month customer is allowed to change number 1 time only. If customer wants to change number more than 1 time in six month there will be service fee of $5 per change each time. 10. Pidipompi.com reserves the right to charge fees, surcharges and/or price at any time upon without prior written notice to you. a. 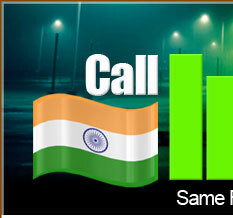 In the $9.99 Call India Plan you can call upto 1,800 minutes/month. b. 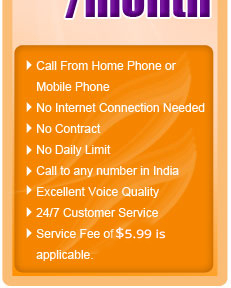 In the $14.99 Call India Plan you can call upto 2,700 minutes/month. 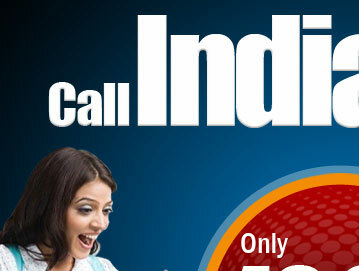 c. In the $19.99 Call India Plan you can call upto 3,600 minutes/month..